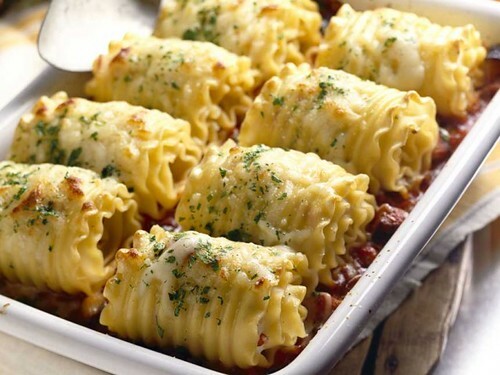 Lasagna made with chicken instead of the traditional beef is a tasty choice which provides a twist on an old favourite and is a great option for vegetarians who want to add a bit of animal protein to their pasta. Preheat oven to 375°. In a saucepan combine chicken, chicken stock, tomatoes, tomato paste, pepper, garlic, thyme, honey, and olive oil and cook for a few minutes. Cook lasagna noodles until tender. Drain and cool in cold water. In a casserole dish place a thin layer of chicken mixture, add a layer of lasagna noodles, slightly crossing each other. Pour more chicken mixture, sprinkle mozzarella and cheddar cheese and add a second layer of noodles, add a third layer of chicken mixture and sprinkle with cheese. Finally add more noodles chicken mixture, and sprinkle with grated Parmesan. Bake lasagna for 25-30 minutes or until top is golden brown.